Isn’t Real Estate Investing for People who Already Have Money? “E” Education: Are you a first time investor? Are you skilled and versed in analyzing proformas? We’ll get to know you, your needs, your criteria, your preferences. We’ll educate you on current market trends, and we’ll help you analyze properties and deals with comparables. 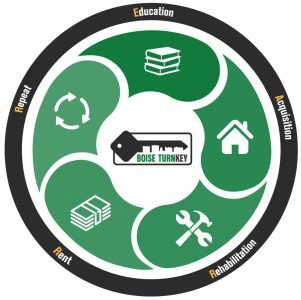 “A” Acquisition: We’re the valley’s premier connection for turnkey rentals. Our partnering agents are highly skilled and local investors, too. We’ll fight for your deal and close. “R” Rehab: Is your new investment a fixer? We will act as your project manager to rehab it and get it rent ready. Time is of the essence. We have a dedicated team of professional, licensed and insured tradespeople ready to attack your project. “R” Rent: We partner exclusively with the Valley’s best investor-owned management company, Cohesion Properties. Your rental will fly off the market to a highly qualified tenant by these professionals. “R” Repeat: We keep an eye on your portfolio and needs. We know you by name, and we know what you’re interested in. We’ll keep an eye out for deals, and communicate as you’ve requested. We want you to succeed and reinvest! We meet you wherever you are in the real estate investment process.